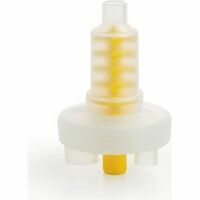 Select your item: 951-5162 Cartridge Dispenser Gun, 1:1/2:1, 50 ml Cartridges 951-5163 Mixing Tips, 4.2 mm, Yellow, 48/Pkg. 951-5559 Mixing Tips, 5.4 mm, Pink for Medium Body, 48/Pkg. 951-5164 Mixing Tips, 6.5 mm, Aqua, 48/Pkg. 951-5557 Mixing Tips, 7.5 mm, Purple for Monophase, 48/Pkg. 951-5165 Intra-Oral Tips, 4.2 mm, Yellow, 100/Pkg 951-5181 Intra-Oral Tips, 5.0 & 6.5 mm, Clear, 100/Pkg. 952-8834 Intra-Oral Tips, 5.0 mm, Pink, 100/Pkg. 952-8836 Intra-Oral Tips, 6.5 mm, Teal, 100/Pkg. Darby Impression Accessories make it easier for the dental office with mixing and dispensing of impression materials. The Cartridge Dispenser Gun has a release lever that coordinates with the plunger to help load and remove the cartridge. The hand held trigger guides the plunger into the cartridge, smoothly moving the material into the mixing tip. 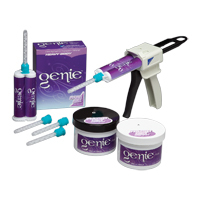 Mixing Tips are used with the dispensing gun for mixing material and easier extrusion into trays or using along with intra-oral tips. 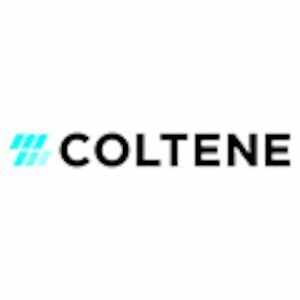 Intra-Oral Tips are used with corresponding mixing tips and allows impression material to flow easily into the delicate margins of tooth preparations, while keeping the material bubble-free. Mixing Tips, 4.2 mm, Yellow, 48/Pkg. Mixing Tips, 5.4 mm, Pink for Medium Body, 48/Pkg. Mixing Tips, 6.5 mm, Aqua, 48/Pkg. Mixing Tips, 7.5 mm, Purple for Monophase, 48/Pkg. Intra-Oral Tips, 5.0 & 6.5 mm, Clear, 100/Pkg. Intra-Oral Tips, 5.0 mm, Pink, 100/Pkg. 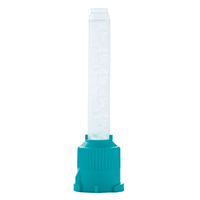 Intra-Oral Tips, 6.5 mm, Teal, 100/Pkg.